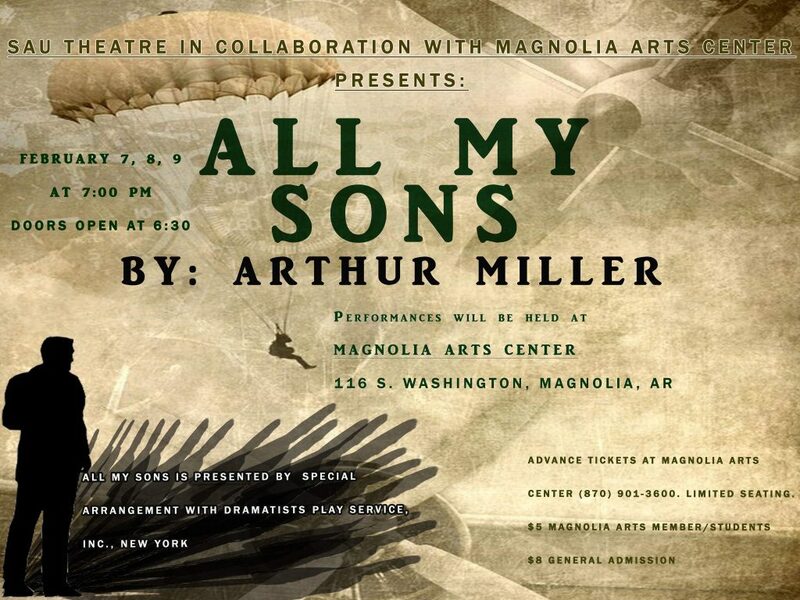 The Southern Arkansas University Theatre Department is excited to be collaborating with Magnolia Arts Center once again to present All My Sons. Written by playwright, Arthur Miller, the play focuses on truth. The story focuses on a businessman who once narrowly avoided financial ruin by shipping cracked machine parts to the military. He blames his business partner and builds an empire, but eventually his crime comes back to haunt him. The play was produced after World War II, and won the 1947 Tony. The cast includes Bodee Starr (Joe Keller), Grace Walker (Kate Keller), Simon Tursky (Chris Keller), Courtney Taylor (Ann Deever), Willie Johnson (George Deever), Jared Hunte (Jim Bayliss), Cat Jones (Sue Bayliss), Zack McJunkins (Frank Lubey), Kayla Ashbrooks (Lydia Lubey), and 11 year-old Tate Stephens (Bert). The play is under the stage direction of SAU Graduate student, Joann Shaver. Joann was also the director of last year’s Magnolia Arts/SAU Theatre Collaboration, World Builders. ALL MY SONS will run February 7 through February 9, shows begin at 7:00 p.m. There will be an actor talk-back following the Saturday night show. Tickets can be purchased at the door, online at www.magnoliaarts.net, or by calling (870) 901-3600. There is limited seating. General admission tickets are $8; Magnolia Arts member and student tickets are $5. The show is recommended for a PG audience due to content and mild violence.